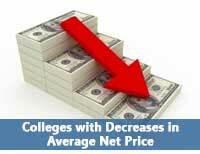 Anyone who spends time on this blog should realize that very few people pay the actual published price for college. This makes it difficult to judge the significance of the rising prices of college tuition. A lot of schools, especially public institutions, justify increasing tuition by pointing out that a certain percentage of the increase will go to financial aid. In other words, students may be charged more but more students will receive financial aid. Or maybe the same number of students will receive more financial aid. We just don’t know. So what to do? Instead of looking at the difference in sticker prices from year to year, we can look at the Average Net Price after Gift Aid. This would take into account the price increases that have gone back into the financial aid program and reduced the actual cost for students receiving financial aid. Of course, this is still based on averages. We still don’t know about if the number of students receiving aid increased or decreased and the same thing about the amount of the award. We really only know that the total amount students were expected to pay was lower. Yes, it’s another case of less than perfect data with limitations in its usefulness. Yet I still post this stuff every week. Why? Because it’s not that different from going to visit a college campus. One day it’s raining, another day it’s not. One group gets a great tour guide, another gets one hung over from the night before. You would be foolish to judge a school by just this one experience. I certainly don’t expect anyone to use only this list to decide on schools. What I’m shooting for is that this list will bring some schools to your attention that you hadn’t considered before. On to the data. Of the 50-50 schools, less than a third had a decrease in the average net price after gift aid from the 2013-14 to the 2014-15 year. This is only a slight change from the previous year where a little more than a third of schools had a decrease. The percentage of private 50-50 schools that decreased their average net price dropped from 33% to 30%. Among public 50-50 schools, 30% had decreases compared to 37% previously. The number of public institutions with increases of more than $2,000 rose to 12 compared to only 5 for the previous period. The number of private schools with increases of more than $2,000 jumped from 23 previously to 33. One increase was over $5,000 and two were over $4,000. Overall, 31% of private schools had a decrease in average net price while it increased at 69%. This week’s list shows all 50-50 schools that had decreases in the average net price after gift aid from the 2013-14 to the 2014-15 school year (the latest available data). As usual, the five-year graduation rate is used for public schools and the four-year rate for private schools.